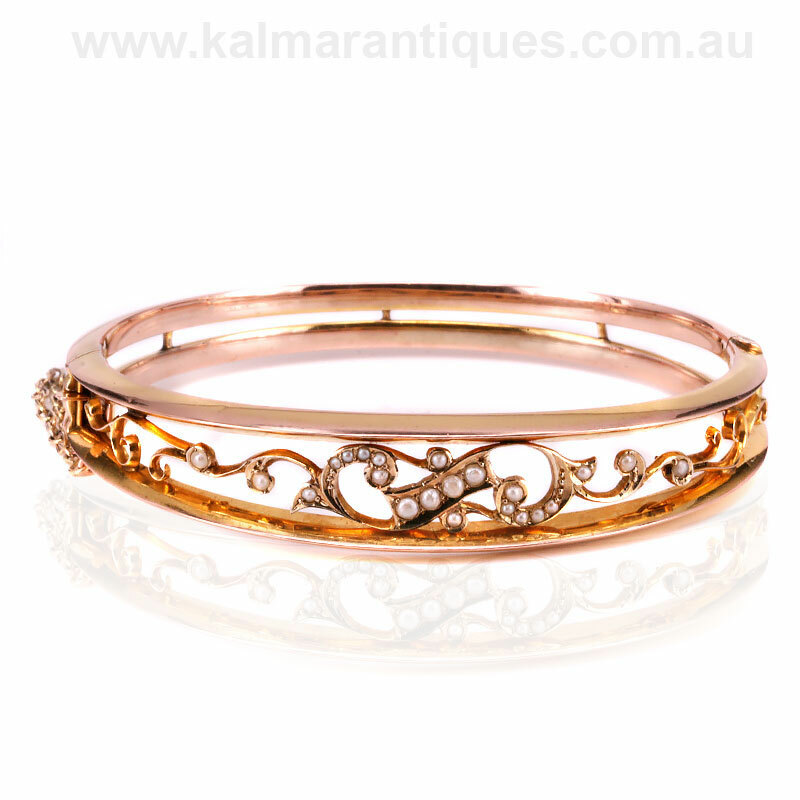 Product code: ES8347 Categories: Antique, Antique Bangle. Antique jewellery was so often well thought out to the smallest details and this can be seen here in this lovely antique hinged pearl bangle dating from the early 1900’s. Not only is the design alone of the bangle so attractive with the gold work wrapping around the front like tendrils, and not only are they set with a total of twenty two seen pearls, but the pearls themselves graduate so elegantly from a mere 1mm in size to 2.2mm. When you look close at the section at the front for example with the curved parts on each side of the front, the pearls graduate in size perfectly highlighting not only the design, but the thought and care that went into making this bangle all those years ago. 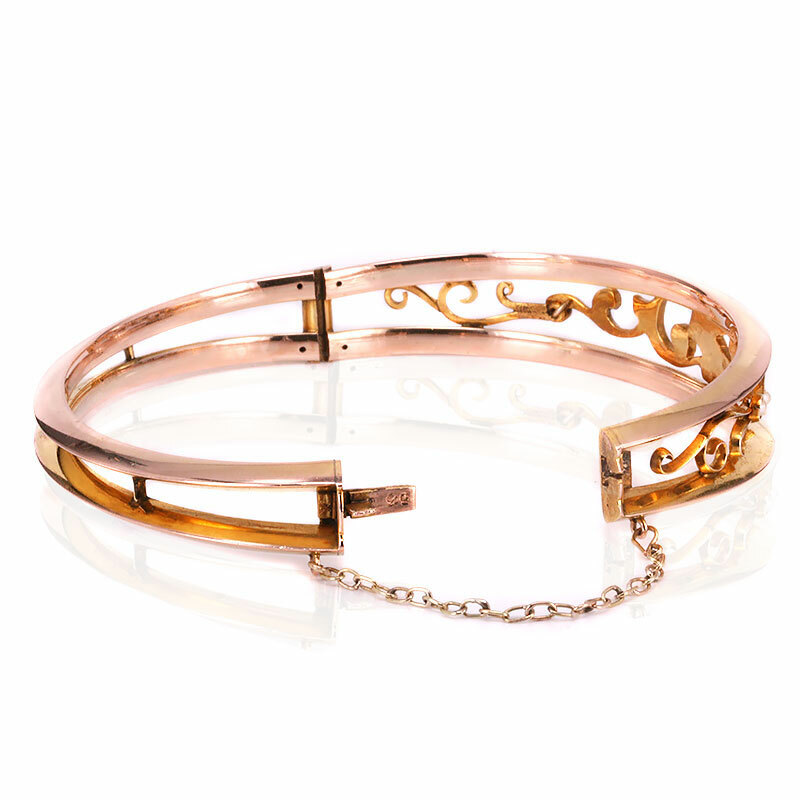 At the front the bangle measures 12.5mm wide and tapers sleekly to 6.5mm wide at the back and because it is hinged, this allows it to sit nice and close to the wrist. Fitted with a safety chain for added security, this is a wonderful example of an antique bangle that is over 100 years old and can still easily be worn every day. Tags: Antique bangle, Antique pearl bangle.